ChateX is an alternative for GameSpy Arcade. 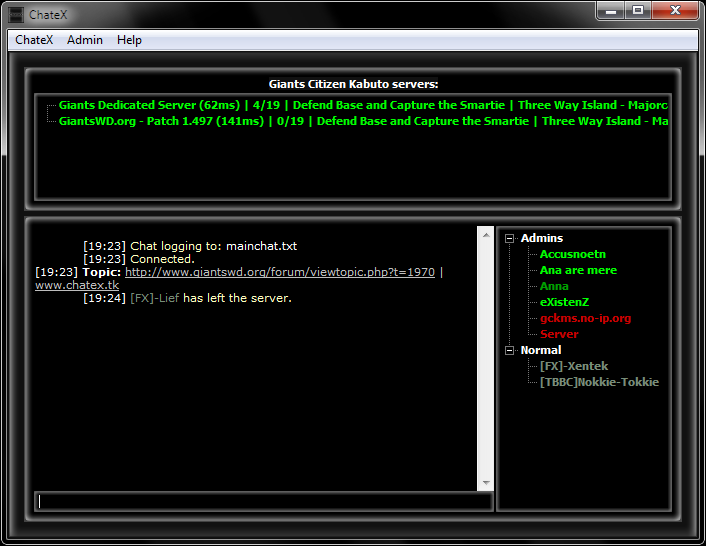 It only supports Giants Citizen Kabuto and it only works with the 1.5 patch. Right click the listbox from the top to create/join a server or double click a server to join one, you can also set the game path manually from ChateX - Options menu. If you find any bugs or if you just don't like something please post here. Thanks a lot to Tasiin! Please note that the program can only be exited from ChateX - Exit menu and not from the close button of the main window (using the close button minimizes the program and hides it to system tray). Last edited by eXistenZ on Sat Nov 26, 2011 9:35 pm, edited 26 times in total. Updated the link above with a new version. Please post your ideas if you have any good ones . Hmmmm.... People can see my server(dedicated) in the internal game browser, but not gamespy or your game browser...any ideas? I have searched for the topic, forwarded all the usual ports(and ANY mentioned ones) but the only place the game is listed is in the in game browser. have you forwarded 8911 UDP port? well what you waiting for, go on it and let's play giants!! is this program the "community official" way to play online at giants? or the "official" (where most of people play) is gamespyarcade?